We, at the Paul King Foundry, are experts on the history of bronze casting and the various techniques used throughout the ages. We have restored and repaired antique bronze statuary. The challenging problems involving new and antique sculpture are approached with the eye of an artist and the hands of a skilled art foundry craftsman. We are specialists in 19th and 20th century European and American bronzes. Authentication of bronze statues by style and technique used is an offered service. We can also recommend scientific analytic testing as a valued resource for the owners of public and private sculpture. As an expert on bronze sculpture, for insurance, legal claims and authentications, we provide examinations of contemporary and antique sculpture as well suggesting treatment options. All treatments follow the guidelines established by the American Institute for Conservation and are documented in written and photographic form. We have produced many small to monumental scale bronze sculptures in USA and in Thailand. 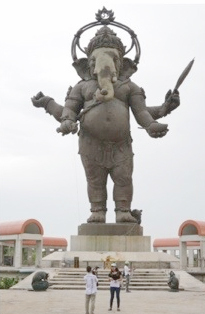 We have made many large scale Buddha Bronzes including the 40 meter (120 feet+) tall Ganesh Buddha in Chachoengsao. Working closely with American and Canadian based artists as well as Asia Fine Art, Fogg Art Museum, Harvard University, Smithsonian Museum, Washington DC and many others have given us the experience needed to serve you. We are internationally known for our conservation services, as we have traveled throughout the US and its territories, Canada, Europe, Southeast Asia and the Middle East for public and private collectors and investors. Fogg Art Museum, Harvard University: Consultation on the techniques of the Ghiberti Gates in Florence, Italy. There was also a consultation on the conservation of Henry Moore bronze. Smithsonian Museum – Washington DC: Numerous conservations at the National Mall. Getty Museum – Malibu, CA: Paper on authentication of bronzes presented by Paul K. Cavanagh. If you are interested in learning more about our authentication and restoration services please contact us through our offices in the US, at the Paul King Foundry or in Asia, through Sculpture Source Asia.